When I first started mountain biking I honestly thought I would never ever want to ride Downhill, down hills was fine, but Downhill is insane. Recently I’ve been rethinking that a wee bit and after going and watching a DH race on Sunday I thought I’d like to at least try and ride the tracks they were using in the race. My how things change. Three of us headed to Vic Park after work yesterday to suss out some easy and slightly more difficult tracks for a prospective women’s only event next year. Southstar are running a shuttle service in Vic Park now so that made organising our little expedition much easier. Michelle and Liv were both keen and both much, much more experienced than me (Michelle used to race downhill and Liv still does at elite level), so I knew I was in good hands. Oh. My. God. It was sooooo much fun. We started off on the new track Seasame Street. It is so sweet, beautiful bermed corners, crazy gap jumps and step downs for the talented on big bikes, nana lines for the less brave, wee jumps and big jumps and just a whole lot of fast fun. Then onto Dazzas, again lovely berms, but with some roots and rocks and interesting lines. From there we did Brents which was a bit trickier, more drop offs, big roots and gnarly corners, but I managed to ride most of it and then on down the 4wd track grinning and doing wee hucks over the speed bumps. 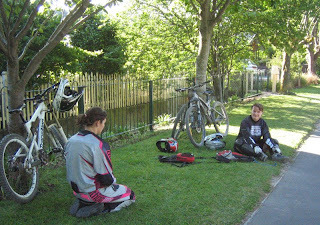 We just missed the next shuttle pick up so there was some sitting round, talking bikes and shite and generally chilling. Next run started in Brake Free, lots of table tops for practising jumping and berms, then Seasame Street again (how could we not), Dazzas again, then a line I think is called Ponos (please correct me if I’m wrong) that was pretty rocky with some exciting blind corners that I walked and some steep sections, then a bit I don’t know the name of, but I’ve ridden it a few times through some rooty stuff and then back down the 4wd track. I think we’re getting a fairly good idea of some tracks to put together, but we’ve decided that Wednesday night shuttles should be a regular occurrence so we’ll have another run next week and get a better idea. I might also go for a walk through the park with my camera at the weekend and take some pics of the various tracks. The 2 runs were so much fun and I rode things I never thought I would, let alone find them to be relatively easy. I can’t wait to go back and do some more, but I think I need to sort myself out with some googles because the dust was horrid. Some proper downhill shorts would also be good so I might have to pay a wee visit to Grind as they have a great range of women’s clothes.